This senior housing project in the Greenwood neighborhood is on a uniquely shaped triangular site along Holman Road NW, with a grade change of 17 feet. The odd shape allows for larger landscape areas at the corners, enhancing the pedestrian experience. 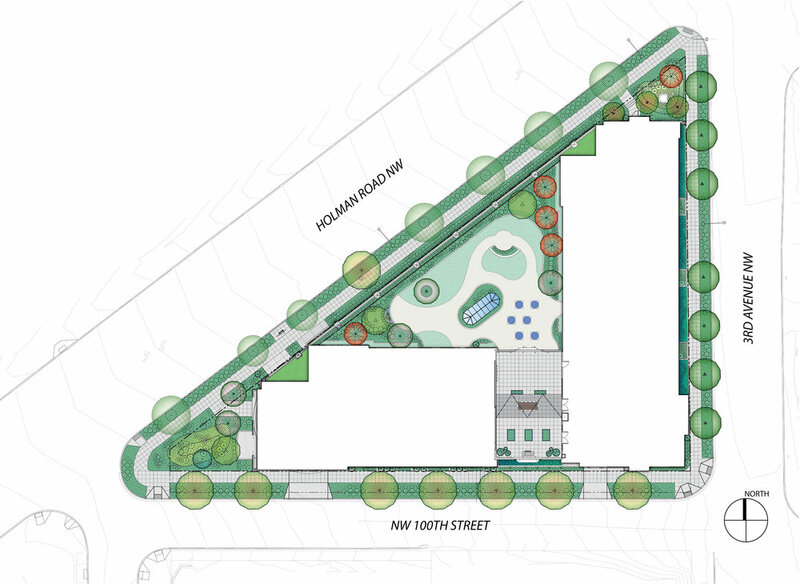 Existing trees along Holman Road are retained, and new street trees, sidewalks, and planting strips are proposed along 3rd Ave N and NW 100th Street where currently none exist. The large memory care amenity deck in the "L" of the building allows for a generous walking path and several areas for seating, a water feature, and several trees. An upper level amenity deck features a movie screen, outdoor dining with string lighting, tenant gardening and a BBQ area, along with raised planters and shrubs. Bioretention along the east façade adjacent to the sidewalk helps mitigate stormwater and provide a buffer for the memory care units. Climbing vines and tall, narrow trees and shrubs around the site help soften the façade, especially with the challenge of the steep grade change.